← Will I Go to Jail for Driving on a Suspended License in Jacksonville FL? Among the five people arrested was Tevyn Alonza Davis. He is only 19-years-old and “was arrested and charged with affray, breach of the peace and resisting an officer without violence for his alleged involvement…. According to a police report, Davis was pulled out of a fight by an officer and took a fighting stance and refused the officer’s commands.” Jaquade Marquis Miller is 18-years-old. He is “facing similar charges for his alleged involvement. Miller has been charged with affray and resisting an officer with violence for allegedly attempting to punch officers attempting to disperse the massive crowd.” Three juveniles were also arrested. The two adults, Miller and Davis, were in first appearance court yesterday for their bond hearings. Miller was released from the Duval County Jail, but he had a special condition. He “was released to the Save Our Sons and must go through its program…. The eight-week program is designed to give the city’s teens and young men another chance. The Save our Sons “program teaches accountability and responsibility, and gives the boys a chance to vent.” Davis was not released to the Save Our Sons program. “Davis said he wanted to join the military and the judge is considering releasing him directly to the military.” As a Jacksonville criminal lawyer, I have never seen someone released to the military after being arrested that was not already in the military. The fact that Davis wants to join the military does not mean that the military will take him. 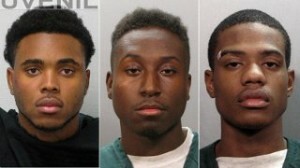 This incident has been compared to two others in Jacksonville FL. One occurred at a Wal-Mart on the North side of the city. Read Jacksonville Wal-Mart Robbery Leads to Arrests for the story. Another occurred in Jacksonville Beach FL on Memorial Day which causes the Jacksonville Beach Police Department to increase security. As with the other cases, police will continue to investigate the crimes that occurred on Christmas Day. If you are being questioned, you do not have to speak to the police officer. You have the right to speak to a lawyer in Jacksonville. There is nothing wrong with exercising your rights and talking to an attorney.